The Legal & Policy Advocacy Project engages with international and regional human rights bodies and other international organizations, international and domestic courts, and the U.S. federal government to promote understanding of and respect for human rights law. 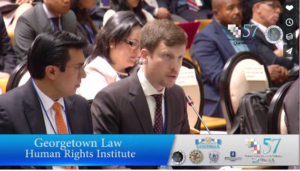 In January 2017, Human Rights Institute Scholars, Santiago Díaz-Cediel, Ignacio F. Grazioso, and Simon C. Milnes submitted Written Observations of Law to the Inter-American Court of Human Rights regarding a request for an advisory opinion, submitted by the Republic of Colombia, which considers the application of the American Convention on Human Rights and obligations arising thereunder for environmental harms caused by a member state that occur beyond its borders. In October 2015, Ian Kysel and Jen Podkul, on behalf of HRI and the Women’s Refugee Commission, submitted their working paper, Interdiction, Border Externalization, and the Protection of the Human Rights of Migrants, as written testimony to the Inter-American Commission on Human Rights for its thematic hearing on Human Rights and the Interdiction of Persons Eligible for International Protection. In July 2014, HRI Dash/Muse Fellow Ian Kysel testified before the U.S. Commission on Civil Rights’ New York Advisory Committee regarding the application of human rights law and U.S. constitutional law to the practice of subjecting children to solitary confinement in New York State. In March 2014, HRI, in partnership with Amnesty International, submitted Written Observations of Law in a case before the Inter-American Commission on Human Rights, Henry Hill, et al. v. The United States of America, regarding the application of norms of customary international law to life without parole sentences for children convicted of crimes that were committed while they were under age 18. In February 2014, HRI submitted written testimony before a hearing of the U.S. Senate Subcommittee on the Constitution, Civil Rights and Human Rights regarding the application of human rights law and U.S. constitutional law to the practice of subjecting children to solitary confinement. Have an idea for a project? Contact HRI Dash/Muse Fellow Ashley Binetti.